Mr Slush is a high-quality slush syrup, manufactured using advanced processes with only premium ingredients used. As far as we're concerned, it is unmatched in quality and taste at the price, and our customers agree! Whether you're an established slush drink retailer or looking to introduce profitable slush into you business, Mr Slush will have kids (and their parents) lining up. With 15 delicious flavours, including the old favourites and best selling Blue Raspberry and Strawberry, and exciting new offerings such as Pink Bubblegum, Pineapple, Cola and Mixed Fruit which tastes just like Vimto. 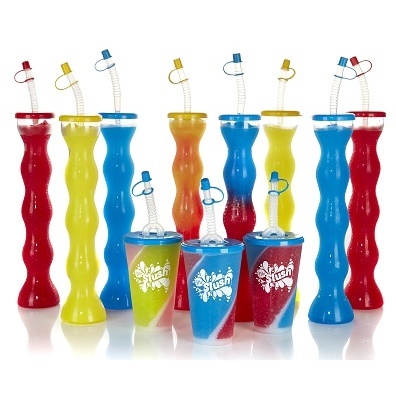 Simply mix one part Mr Slush syrup with 6 parts water for perfect slush drinks every time. Mr Slush offers an amazing return on investment for retailers. Your cost per 7oz slush drink is just 12p, and this is not just for the syrup - it includes the cost of the slush cup and scoop straw spoon. On average, a drink of this size is sold for 85p, giving you a very nice 700% return. We want to support our loyal customers, and so offer discounts and special offers on larger orders, as well as providing loyalty points for online orders. Is it possible to get slush syrups elsewhere for less? Sure - cheap slush syrup is always available to buy - but spending an extra 1p per drink is worth it when you gain the quality product that is Mr Slush, made with premium food grade ingredients and 100% British sugar. Mr Slush is not a bargain-basement product. We're proud to offer a premium, high-quality syrup. This emphasis on quality has two important impacts on your business. In the busy season, your slush machines could easily be running for 10 hours a day. With that level of output, a quality product is essential. We understand the science behind slush-making. With too much sugar, your mix will be sloppy and messy, leading to unhappy customers. With too little sugar, or the use of artificial sugars or sweetener substitutes, the mix can become thick and over-frozen, meaning your machine motor gearbox is placed under excessive strain, increasing your maintenance costs and leading to lost sales while you wait for the machine to be repaired. Our emphasis on quality means you can rely on our brand. Did you knoe we offer more than just our standard range concentrates? Check our our family of brands such as our 99% fruit range, smoothie slush and the UK's leading frozen ice cocktail syrups, Mr Slushed. We're ready and waiting to bring Mr Slush to your door. Order on-line now and you'll receive next working day delivery.